Bio: Marek Swiatecki is an award winning Polish artist who had his first solo exhibition in 1977. He has worked in music and in theatre, and used to paint and sell pictures in the streets of Paris. 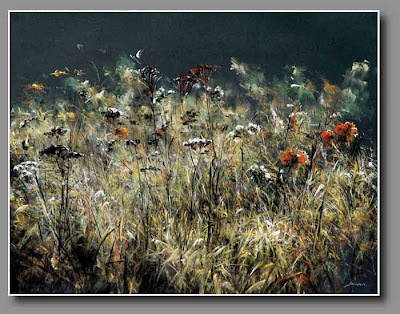 He is a member of the Association of Polish Artists and Designers, the Association of Polish Pastellists, Art du Pastel en France, Italian Association Optimae Artes and the Pastel Society of Eastern Canada. Navigation: Site is in Polish and in English. There are no ”back” links from the main pages, so get used to the PC back-button. Alternatively, open each fresh page by right-clicking and choosing “open link in new tab/window” (assuming you’re using Internet Explorer). Gallery: Pastel Art is the main gallery page. From there the choices are Forest; Lakes and Rivers; Swamps and Marshes; Seascapes; Just Grass; Winter; Pets. Image View: Thumbnails are scattered artisticallyaround gallery page and fade in and out – they are all active links and must be opened individually – again, right-click and choose “open link in new tab/window” or you’ll be forever going back and forth. And you will want to see them all (Marek is prolific). Especially check out his tryptich on the Swamps and Marshes page. Data is attached to each enlarged image. This picture, Herbs Pharmacy. Is 77x550, 47 KB.